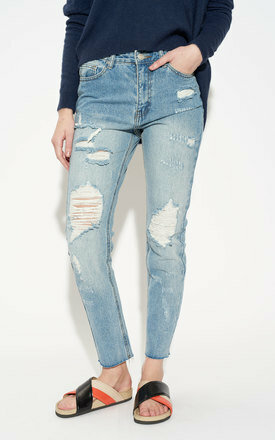 Cool tone blue boyfriend jeans with a high waist fit and cropped frayed hem legs. With distressing on the legs and a slim but relaxed fit, these jeans are effortlessly cool and extremely comfortable. Wear them with ankle boots and trench coat in the winter or a simple T shirt and sandals in spring. The beauty in boyfriend jeans is that you can alter the length as you wish: if they are too long, then roll them up!